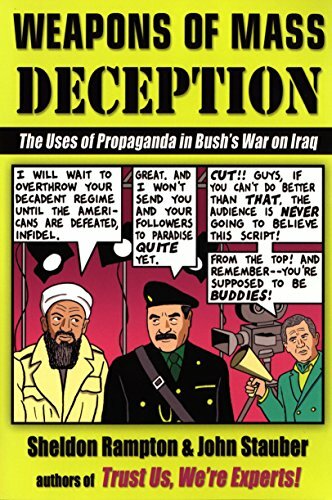 As government officials and observers battle over whether or not the Bush administration exaggerated intelligence reports of Iraq's weapons of mass destruction to justify war, there should be a ready audience for this new book by the authors of Believe Us, We're Experts! Professional debunkers of media manipulation, Rampton and Stauber unmask the impact of "information warriors and perception managers" (as one PR consultant described himself) on Bush's attempt to turn public opinion in favor of war on Iraq. The authors deconstruct the PR campaign to promote the U.S. in the wake of September 11: the State Department's hiring of ad exec Charlotte Beers ("the queen of Madison Avenue") to direct the campaign; how PR execs and lobbyists helped construct the government's anti-Iraq message; the administration's alleged misinformation and distortion of facts and reliance on rumor to influence public opinion. Anyone skeptical of the reasons for the war against Iraq will find their suspicions enhanced here. Sheldon Rampton and John Stauber's "Weapons of Mass Destruction" is a timely book that provides valuable context and analysis about the recent war with Iraq. The authors are seasoned media critics who are skilled at deconstructing propaganda and unearthing the motives that drive U.S. policy in the Middle East. Like in the movie 'Wizard of Oz', we realize that almost everything we have been told by the political leaders who have been hiding behind the proverbial curtain of PR spin has been patently untrue. Rampton and Stauber begin the book by discussing the role U.S. propaganda has played in the Middle East from the post-WW II era to today. The authors contend that America's self-professed image of promoting democracy has clashed severely with the reality of its support for petty dictators and monarchs who, in return for U.S. support, ensured a steady supply of oil. The authors insist that this is the reason why the post-9/11 "branding" campaign to favorably influence Arabic opinion of America failed miserably. On the other hand, selling the Iraq war to the American public has been much more successful. The authors discuss the role that PR professionals, the CIA and conservative groups played in the anti-Saddam media blitz that was heaped upon the U.S. citizenry. Perhaps not surprisingly, we learn that many of these players could profit handsomely when Iraq's oil reserves become privatized. Rampton and Stauber examine the increasingly close relationship between the U.S. military and the media. The authors debunk the infamous 'incubator babies' story from the Gulf War era but show how such misinformation can be used to successfully influence public opinion. Likewise, claims that a Saddam-Al Qaeda connection may exist and that Saddam may possess weapons of mass destruction were known to be false, but the repetition of these lies by authority figures implied truth and persuaded many people of their validity. In possibly the most important section of the book, Rampton and Stauber remind us that most of the terrorists involved in the 9/11 attacks were Saudi Arabian. The authors contend that deep financial ties between the Bush administration and Saudi Arabia has compromised U.S. response to the terror crisis. We learn that the Kingdom funds anti-American Wahhabism in order to channel street-level resentment of elitist privlege away from the Saudi monarchy and towards the U.S. government. This duplicity is deeply disturbing and is a sad testament to how badly American foreign policy has been compromised as a result of its selling out to big oil. The authors go on to discuss the use of doublespeak, fear and the corporate ownership of media in shaping public discourse. Interestingly, we discover that people who watch TV the most actually know less about important topics than others. No doubt this phenomenon has something to do with the deployment of Pentagon "combat camera" crews and "embedded" TV reporters who overwhelmingly presented a pro-U.S. bias with little critical context or analysis. On the other hand, images played to foreign audiences more often depicted the brutal realities of war: the dead and injured Iraqi people, their devastated homeland, and the contradictions of U.S. policy. In the end, "Weapons of Mass Deception" warns us about the dangers posed to democracy when leaders and citizens believe their own propaganda. I strongly encourage everyone to read this outstanding book.